What does the word “Chicago” mean? The official origin is that “Chicago” is the French version of the Miami-Illinois word shikaakwa (“Stinky Onion”), named for the garlic plant (not onion) Allium tricoccum common along the Chicago River. 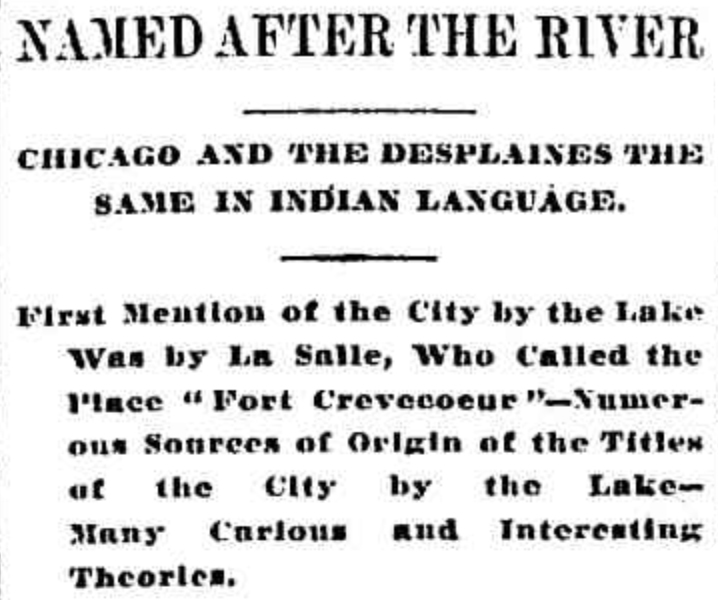 Those who pretend to make any positive assertion as to the correct meaning of this word, as an Indian word, seem to have confined their investigations on the subject to the Indian language as spoken by the Ojibways without reference to other dialects, seeming to ignore the fact that it could come from any other source, whereupon they reached the conclusion and so assert that it means onions, garlic, leek, or skunk. So far as appears at this day there seems to have been no special inquiry into the origin or meaning of this word until about the time of the rebuilding of Fort Dearborn in 1816. The year following that event Colonel Samuel A. Starront visited this place, and in a letter to General Jacob Brown of the United States army referred to the river here as ‘The River Chicago, or in the English, ‘Wild Onion River.’ The definition of the onion by the Rev. Edward Welson in his dictionary of the Ojibway language is keche-she-gaug-vh-wunzh. He defines skunk as zhe-gang. John Tanner, for thirty years a captive among the Ojibways and many years United States Indian interpreter, in a ‘Catalogue of Plants and Animals Found In the Country of the Ojibways with English Names,’ appended to the narrative of his captivity, defines skunk as she-gang. He defines onion as she-gau-ga- (skunk weed). 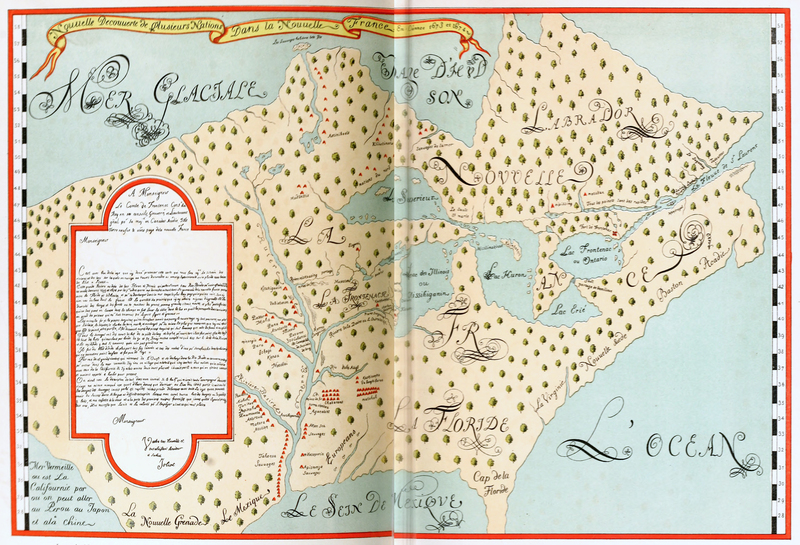 In a note thereto by Dr. James, editor of Tanner’s narrative, it is added: From shih-gau-ga-winzhe, this word in the singular number, some derive the name Chicago.’ It is noticed that all who contend that the word Chicago as applied to the river and city of that name means skunk, onion. or the like, derive their convictions on the subject from one or more of the authorities which are before cited, or from some one familiar with the Ojibway language who forms his convictions to the same effect from the coincidence of sounds. History is so unsatisfactory and varied in regard to this word that we are left to this day to determine its meaning solely on the basis on the similarity of sounds. For there seems to be no fact or incident narrated or mentioned in history that leads with any degree of certainty either to the original meaning of this word or to the dialect from which it is derived, And it is to be confessed on the theory aforesaid, conceding that the word comes from the Ojlbway language or dialect, no one is prepared to dispute the assertion so generally made that the word is derived from ‘skunk.’ The word skunk being in the Indian tongue simply she-kang, in order to make Chicago the theory adopted Is that ong, an Ojlbway local termination, is added which makes Chi-cag- ong, meaning at the skunk, the sound ng being dropped In common speech, leaving the word in the form now used. Whilst this is not inconsistent in practice in dealing with Indian names there is another theory. It is suggested. which may be adopted in this connection that would seem to be equally consistent. The word Chi-ca-go without adding ‘ng’ would be a fair Ojlbway expression. The sound ‘o’ added would denote the genitive and might be rendered thus, ‘Him of the skunk,’ In case it would probably be the name of an Individual, and it is stated that this word is the name not only of some one Indian chief, but the name also of a line of chiefs during several generatIons. The most that can be said of the word with any degree of certainty is that it is of Indian origin and comes from some dialect of the Algonquin group, so called. It must be noted, however, that in the Ojibway dialect this word, or that which is essentially the same, is not confined in its meaning to that contended for as before mentioned. The word may mean also in that language, to forbear or avoid, from kah-go, forbear, and che, a prefix answering to our preposition to; or, it may mean something great from kago, something, and ‘chi,’ from git-che, great. Besides several other words or expressions which may be found in this dialect of the same sound, yet of different meanings, Chi-ca-gua was the name of a noted Sac chief, and means in that dialect ‘He that stands by the tree.’ In the Pottawatomie dialect the word choc-ca-go, without addition or abridgement, means destitute. I was told that the name came from the hot air ( wind came from politicians and all the hot air they were blowing around. Please tel me if there is any truth to that? Yes. That is called “Bragging” as it is explained extensively in the article.